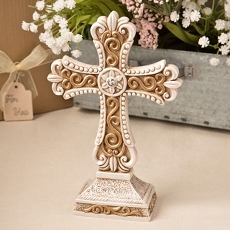 Choose these Regal Favor Collection cross themed candle holders as religious favors with lasting appeal . 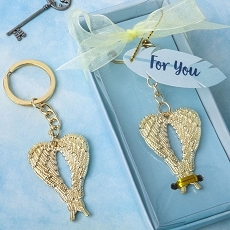 A spiritual keepsake for a day filled with faith, love and togetherness, these attractive candle favors are a blessing for any religious occasion - from First Communions to Confirmations to weddings. 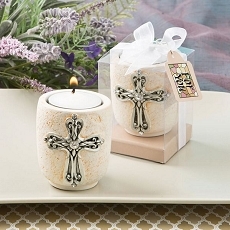 From Fashioncraft's exclusive Regal Favor Collection, each candle measures 2" round x 2" tall and features a rhinestone enhanced round pewter finish poly resin base with a "fit for royalty" pewter-finish-accented inlaid enamel ivory cross rising up with multiple rhinestone enhancements. 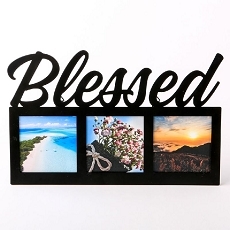 A frosted white glass votive holder sits in the base with a poured white candle inside. 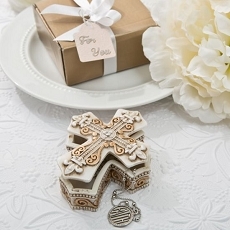 Each regal cross candle comes in a clear box with a silver cross-design staging base, tied with a white organza ribbon and an attached matching design "For You" tag .